This marvellous aerial photograph of the home of ESO’s Very Large Telescope (VLT), fully demonstrates the superb quality of the observing site. This space wallpaper reveals a marvellous aerial photograph of the home of ESO’s Very Large Telescope (VLT), fully demonstrates the superb quality of the observing site. 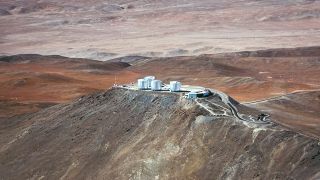 In the foreground we see the Paranal Observatory, located at an altitude of 2,600 metres on mount Paranal in Chile. In the background we can see the snow-capped, 6,720 meter-high volcano Llullaillaco, located a mind-boggling 190 km further East on the Argentinean border.Clearly visible in the image are the domes of the four giant 8.2-metre Unit Telescopes of the VLT, with the Control Building, where astronomers carry out the observations, in the foreground.